Other antiquities on the Cleveland Museum website! Lately the interwebs have been abuzz with news of the Cleveland Museum acquiring a Roman portrait head and a Maya pot which do not have solid pre-1970 provenances. To me, these scandals all swirl together to form a big mess and, besides, I tend to think in terms of legislation and legal ownership claims when I worry about provenance dates (sorry team, if it left Bolivia after 1906 you can’t make me feel that it is legal; illicit is a fine enough term). I’ve been halfway looking at this one because the Maya vessel in question reeks of the November Collection era of import and was published in the same book as the Grolier Codex (Coe’s The Maya Scribe and his World, 1973, first time we saw that sucker! ), a book that I leafed through a few months back for an article that will be on our Trafficking Culture website come next week. 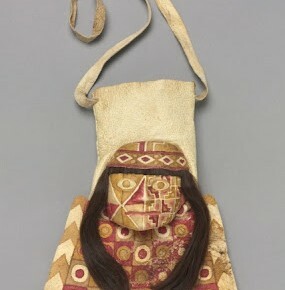 The piece that leapt out at me was a Wari pouch made of hide and human hair. It was offered for sale as lot 108 in the 13 May 2011 African, Oceanic and Pre-Columbian Art Sale (N08749). I remember looking at it and thinking ‘Well that is weird, could it be a fake?’ and then thinking “I guess you can sell human hair but where do you draw the line? Which body bits can you sell and which are illegal?” Either way the pouch stuck in my mind…and there it is in Cleveland. They bought it for $146,500 and it isn’t even on display. Now here is a sincere question. Why isn’t anyone mad about the pouch? See, to me that is a solid surface date of 1976 with an unsuitable hypothetical provenance of ‘1964 or 1965’. The scenario described is roughly ‘I bought this in some year, I forget which, but it was before 1970, from someone who is dead, and I don’t have paperwork on that since I don’t know the exact year, and I waited over a decade to publish this special thing’. To me that seems as iffy a provenance as exists for the portrait head and the Maya vase. Why didn’t anyone cause a row over the Wari pouch? Yes, perhaps there is information that both Sotheby’s and the Cleveland Museum are holding back on the pouch. Perhaps the former owner regularly posed for photos with while holding newspapers from the 1960s or something. Maybe that is it. But barring that, what makes this provenance any more solid than the provenance of the two recent acquisitions? This really is a silly question, I don’t even know why I am asking it. I am more just interested in seeing the pouch turn up again. I’ve spent so much time with piles of South American auction catalogues that I have reached a point where I see the sale of the objects as the end of the road. I feel like once they leave the block they fly off into the abyss never to be seen again. The catalogue is my last look…where I can imagine what might have been. In a way that is almost better than seeing an object turn up in the collection of a museum that appears to have absolutely no sense of acquisitional reality. Did y’all really need that head and pot? Really? Was it worth the bad press? But in typing that, I wonder if they truly didn’t anticipate the bad press. I mean, heck, they bought that pouch and no one said anything.